Atmos Boss Review - A Dry Herb Vape That Performs? We have tried for you the new Atmos Boss, one of the smallest pen-shaped vaporizers for dry herbs. The device is among the strong performers and gathers practicality, design, and quality. The Atmos Boss has a sophisticated system designed to offer efficiency and satisfaction combined. Find out more below. Quick heat up (up to 45 seconds). The Atmos Boss is a lightweight, portable and durable wonder. The pen is designed to vaporize dry herbs evenly and with consistency. It has a high-grade stainless steel chamber that heats up quickly and consistently. The heating element in the chamber keeps it from touching the dry herbs, thus from combusting. Unlike ceramic chambers that usually produce more taste, the Boss’ stainless steel chamber might give neutral flavors. However, it still offers a quality and smooth vapor. 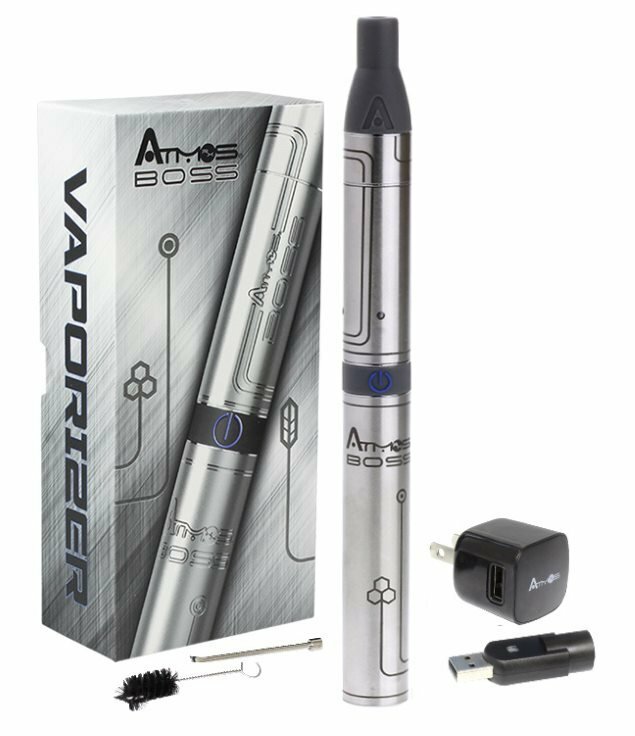 Combined with a smooth airflow system, the Atmos Boss offers a great experience and gives the most of the vapor taste. And the steel of the heating chamber also ensures the vapor coming out is pure. We think the Boss fast heating time is perfect (it already heats up the herbs after 20-30 seconds) and LED light colors indicators, it all makes it easy enough to understand and to use. There is no adjustable temperature control, only a unique temperature that sets to about 400°F. However, it is still hot enough to give thick vapors. Another thing we like is that the device has an auto shut-off mechanism that turns off the heat after 50 seconds. Some might find it too short, but we think it actually saves significant battery power. Charge the battery fully for about 2h, until you see the light turning green. Once fully charged and unplugged, fill up only half of the chamber with your herbs (up to 3/4 max). It is crucial to leave 1/4 space to allow a good air circulation while drawing. Screw the mouthpiece back to the device, then press the power button five times to unlock the device. Once the LED light blinks, press and hold the power button to start heating up. The vaporizer shuts off automatically after 40-50 seconds of nonstop vaping. When it happens, press the power button quickly again, to reactivate the device. Cannot be easier than that. We loaded up the Boss since the battery was ready to go. In fact, it was delivered pre-charged so you can use it right away. We first removed the draw stem from the connector by unscrewing it. Then we filled the tank with finely ground peppermint (mentha piperita). It is important not to fill to tight. We filled about half the chamber, but you can push it up to 2/3 maximum. Then screwed the draw stem back and turned on the Boss. Five clicks on the button will unlock and enable the power switch. Next, we pressed the power button firmly for 3-5 seconds and released it to begin vaporization. The LED indicator turned from red to green. It means that the Boss is fully heated and ready for use. We really appreciated the 3-5 seconds preheat time. It heated up fast and lasted a long time. Getting to business, we had a consistent vapor size and quality. The peppermint taste and flavor were surprisingly good and tasty. We could taste a smooth peppermint flavor from the second draw, which was really nice. Since there are no temperatures settings, the Boss goes from zero to its peak temperature (380-400° max), in a few seconds. However, we could regulate the vapor quality a bit differently: slowing down our draws rate created thicker vapors, and drawing at quicker rate created slightly thinner vapors. All depending on how you like your clouds. However, this did not influence the taste, which remained consistent. The Boss can produce a quite dense vapor, with quality flavors and without a trace of smoky smell or taste. It heats the material evenly to offer a good taste. The taste might sometimes be neutral or flavorless due to its stainless steel chamber (ceramic chambers usually offer more vapor taste). Easy. Use a brush or q-tip to remove any remaining herbs in the heating chamber. Then apply a small dab of alcohol on a q-tip, and clean the chamber. The mouthpiece should also be cleaned regularly, simply wipe down the plastic mouthpiece with a damp cloth to remove any dirt you find there. The Atmos Boss has a 1200mAh battery, which can easily be unscrewed from the herb chamber. It features an auto shut-off option, which helps to preserve the battery life. The battery can be charged directly from a computer or using the wall charger part. The pen comes pre-charged and ready to use directly after opening the box. The Rx is very efficient with concentrates, but requires a bit more finesse with herbs, mainly because you would need glass screen filters to avoid direct contact with the herbs. So this requires technique but gets easy with practice. However, if you only and simply want to vape herbs, then the Atmos Boss is your product. While the Boss might not offer any revolutionary features, we found that it is a consistent and reliable vapor pen. It has a decent heat up time, ideal temperature and battery size, which ensures a quality experience. It is simple to use thanks to its unique heating mode. We really like the slim size and the pen-style design; it just makes it so easy to carry around, and nice to hold in hand. You will get to enjoy your favorite flavors in full discretion. Also, the strong plus is that it comes pre-charged, means you can use it straight away, a second after opening the box. How handy! Overall, we found the Atmos Boss a good compromise. I have an Atmos Jump now and wondering if this would be as good or better?